Let yourself wake up by the view of a lake, watch the sunset above the water horizon from the terrace. 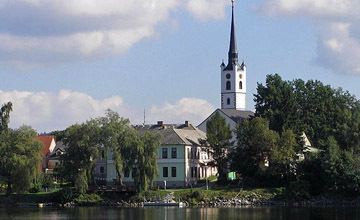 First of all, the Kovarovsky peninsula is a unique place that has no comparison at the area of Lipno. View that you may find a bit kitschy at first sight, mild slope due to which terraces of each apartment and gardens of every plot offer a perfect view of the water level, sometimes from multiple sides. After all, we are at a peninsula isn't that right. If you interested to learn more about the plots or apartments for sale, please click on any of the underlined links. If you wish to learn more about the beauties of that locality, continue to read below. What can you do at Kovarov, besides tying boating knots in a local marina? Summer is the best period in Kovarov. However, if you get bored by sitting with a glass of a cold drink and barbecues at terrace, you can for instance cycle and enjoy plenty of new, quality and maintained cycle tracks. The area of Lipno, as you certainly agree, can be proud of beautiful nature that should be thoroughly examined. Due to sophisticated system of marked tourist routes you can plan a walk directly from your new home. The Lipno valley water reservoir is perfect for swimming and many different types of water sports - yachting, windsurfing, kiteboarding, etc., in summer. The upper flow of Vltava river and the southern part of the Lipno area are the real paradise for watermen. Fishing fans will appreciate wide fishing opportunities around the entire Lipno dam and neighbour rivers and small rivers, as well as a private fishing preserve, directly at the Kovarovsky peninsula that is intended for the future owners of plots and apartments. What more can you be doing in summer? (golf-sterngartl.at) in about 35 km distance from the Kovarov plots. You can get yourself refreshed and slide with your kids on a slide in the Lipno Aquaworld, you can ride on a summer bobsleigh track, or jump in little balls in a children's Hopsarium. 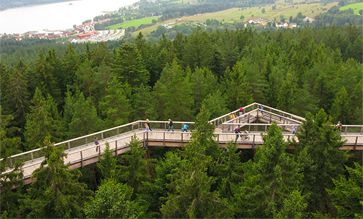 We also recommend a walk on Path in tree crowns to enjoy the breath-taking view of the dam. Summer at Lipno offers perfect local opportunities to go sightseeing, either to see historical monuments (the Krumlov castle, Rozmberk, the Hluboka castle), as well as technical monuments or museums and galleries with interesting permanent expositions. Very popular are also local traditional historical festivals and ceremonies that are held every year within the "Lipno cultural summer" in many villages of the region. Fill in a few fields below and we will get back to you. We will be pleased to show you also Lipno near the lands and apartments. You can do so much more than to skate in Lipno in winter. 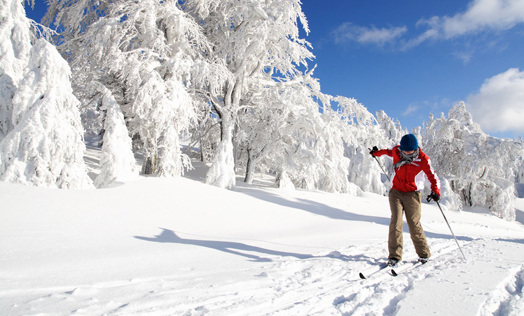 Let's start with skiing and the Kramolin centre, which is some 15 minutes drive from Kovarov. You can go skiing even at night under artificial lighting. Your kids can be taken care of; you can put them in the local skiing school where they will be learned how to turn the right way. If you go some 20 minutes further, you will reach the Austrian ski centre in Sternstein. In the wider area you can ski still in na Hochficht (approx. 50 min). Skiing includes also cross-country skis. You will find over 40 km of cross-country ski tracks; either on neighbouring meadows, or directly on the frozen Lipno dam level. When you get tired by cross-country skiing, put on snowshoes and explore the deep white forests of the Sumava mountains. Who seeks more adrenalin, may try ice-surfing, bobsleigh track or dogsled races. On the contrary, we encourage adrenalin lovers to not drive over the frozen Lipno water dam in their cars. In winter you can get warm not only by doing winter sports. About 5 minutes from the Kovarovsky peninsula there is a Frymburk wellness centre where you can get a massage, go to sauna, or relax in a salt cave. Children will appreciate toboggan in a local aquapark, and recreation sportsmen a swimming pool and a whirlpool. About 15 minutes from Kovarov there is a sport indoor arena Lipno point offering covered tennis courts, squash and badminton courts. 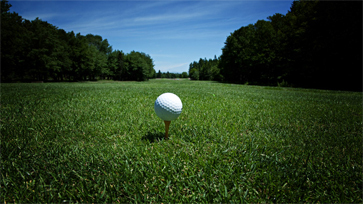 Golf lovers can use an indoor simulator, where you will forget that there is a twenty-centimeter layer of dusty snow on your favourite eighteen-hole course. Where to go to close neighbourhood to get some culture, good lunch, or just for a trip? The town of Frymburk, a yacht marina, offers among other tennis courts, rich offer of restaurants, cultural and sport activities, and is a popular destination of many Czechand foreign tourists. In about ten minutes drive from Kovarov you can find a Lipno a yacht marina and a fully furnished sport and cultural centre that offers a summer sleigh track, horse ride, windsurfing and many other leisure time activities. About a half an hour drive there is a town of Cesky Krumlov, a town of cultural heritage with approximately 300 listed objects in a historical centre, the second biggest UNESCO listed castle and manor complex in the Czech Republic, the oldest baroque theatre in the world, tortuous streets, romantic corners and a unique complex of townhouses with an imposing dominant of the manor above the Vltava river meander, excellent exhibitions of world known artists, concerts, musical festivals, theatre performances, pubs, cafes and medieval taverns, diversified mixture of tourists from all over the world - all this is Cesky Krumlov - a small but also cosmpolitan town with unique atmosphere, surrounded by intact, beautiful nature. (Budweis in German) is a statutory city and a metropolis of the region of South Bohemia. The city is sometimes called a city of beer or a city of pencils. 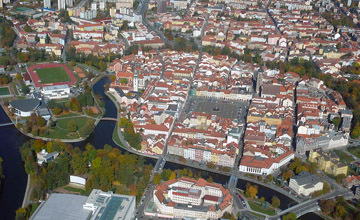 It is situated in the basic on Ceske Budejovice on the junction of the Vltava and Malse rivers. The historical centre of the city, whose regular street network belongs to the top of the medical urbanism, hides a number of valuable sightseeing options - like for example the Cathedral of St. Nicholas, Samson Fountain, Black Tower, or the Monastic Church of Virgin Mary, the architectonically most significant monument of that South Bohemian metropolis. 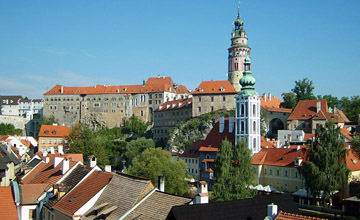 Ceske Budejovice is also a cultural centre of the region of South Bohemia. The city offers to its visitors lot of galleries, art houses, theatres, musical and theatre clubs, as well as cinema multiplex, outdoor and covered cinema places. Trebon is a town situated in the Trebon basin on the Golden drain between the lakes Svet and Rozmberk. It has almost 9,000 citizens and is a spa town and the centre of the Protected Landscape Area of Trebon. The town is often visited by tourists mostly for its historical centre (the fountain at the T.G. Masaryk's square, the Schwarzenberg Tomb, the Trebon castle) and the aforementioned spa services. The Regent brewery resides there. It was founded in 1379 which classifies it among the oldest breweries in the world. There is a residence of the State regional Archive with all-region competence. The centre of the city is a urban reservation. The landscape is protected as a biosferic reservation protected by Unesco. is situated on both banks of the Vltava river. 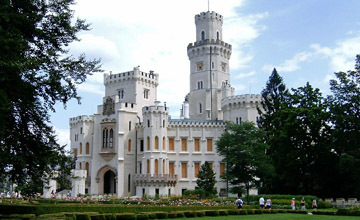 Its history relates to the royal castle Hluboka founded by Premysl Otakar II. The castle concentrates a rich interior with valuable furniture, unique carvings, number of paintings, precious tapestry, artistic glass and porcelain. Around the castle there is a large English chateau park with many rare woods from where there are beautiful views to nearby Ceske Budejovice, Novohradske mountains and Sumava. A former riding hall neighbours with the castle. Since 1956 there is Als South Bohemian gallery with an exposition of the South Bohemian gothic art, an exhibition of Holland painting of the 17th century, and exhibitions of 20th century modern art. There is also a zoo at Hluboka with mostly small European animals, a public pool with toboggan, about 40 restaurants, covered pool with a sauna, modern cinema, outdoor and indoor tennis courts, winter stadium, baseball hall, driving-hall, golf course, fitness, a thick chain of cycle tracks in the nearby area and a cycle track to Ceske Budejovice, water transport, water skiing, and a nearby airport in Hosin. is a district town in about 40 km distance westwards from Ceske Budejovice. It emerged in the 11th century as a market settlement and, besides a beautiful historical centre; it is a centre of cultural happening in the region. 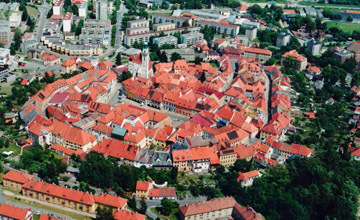 The town of Prachatice is among the best preserved urban complexes in the Czech Republic. 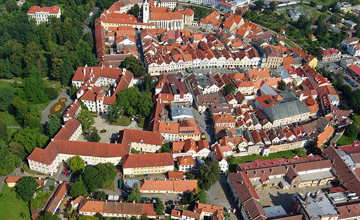 The town´s historical centre preserved its renaissance shape inside a ring surrounded by yet well preserved town walls. For the above reason, the historical centre was declared an urban reservation in 1981 - this level of monument protection gathers just 40 best preserved towns in the Czech Republic.